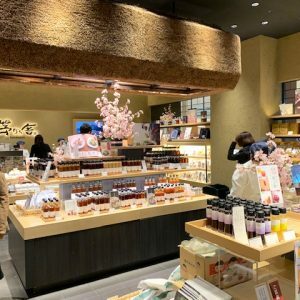 Given its abundant use of fresh herbs, its relatively delicate yet complex flavors and French-influenced refinement, Vietnamese cuisine would seem to be a natural favorite of Japanese foodies. 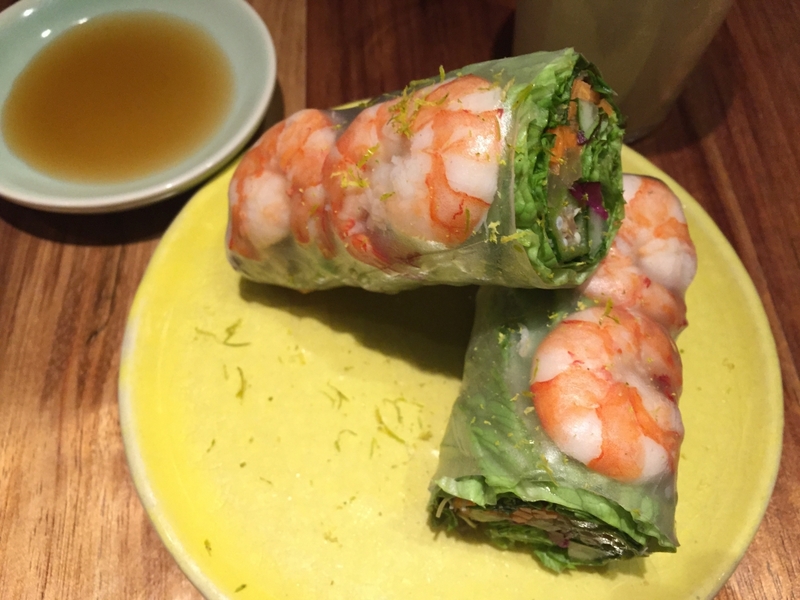 So, it is seems somewhat surprising that while there are many restaurants in Tokyo that serve Vietnamese dishes, there are few that offer Vietnamese haute cuisine or venture creative interpretations of Vietnamese staples, such as fried and fresh spring rolls or pho noodle soups. Many years ago, we were able to enjoy the sophisticated cuisine and peaceful atmosphere of Dusit Thien Duong, a refined Vietnamese restaurant that was decorated predominantly in white and was housed in a modern high-rise somewhere in between Ochanomizu and Suidobashi, just north of Tokyo’s Imperial Palace. But sadly, Tokyo’s Dusit Thien Duong closed many years ago and since its demise, I basically more or less gave up on Vietnamese restaurants in Tokyo, which tended to be small, no-frills eateries with predictable – albeit occasionally tasty — offerings that were hardly special. 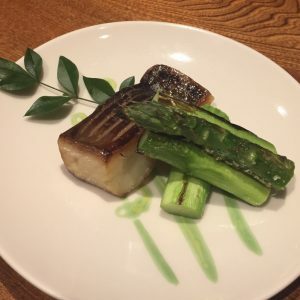 But that was before I came across Ăn Di, a charming and cozy eatery tucked away on a quiet side street in Gaienmae, near the affluent Aoyama district. The first thing that struck me upon entering Ăn Di was the friendliness of the young staff, which immediately made me feel welcome and relaxed. The second thing I noticed was the interesting mix of clientele dining at nearby tables – two very elegant ladies in kimono, a hip-looking young man with an older lady whom I guessed was either his mother or a patron, a father who looked Japanese and his exotic-looking daughter who did not speak Japanese. The table my husband and I were given turned out to be an excellent vantage point to watch the activity in the kitchen, where two chefs were moving about busily preparing the dishes. 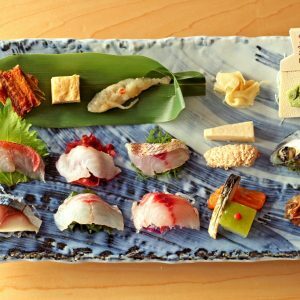 We opted for the Y5,900 tasting course featuring seven dishes and were tempted by the drinks pairing, which includes sake as well as wine, for a total Y4,900. In the end, I decided I would rather stick to wine, particularly since the proprietor of Ăn Di is a well-known senior sommelier, Motohiro Okoshi, whose wife, Momoko Shinjo, is also a sommelier. No wonder then, that Ăn Di stocks a good selection of wines from around the world, including bottles from Georgia and the UK. Our first course was a most unusual salad, which I had never tasted before, known as laphet thoke, or pickled tea leaf salad. The unusual combination of ingredients makes this salad pleasing to both the eye and palate. 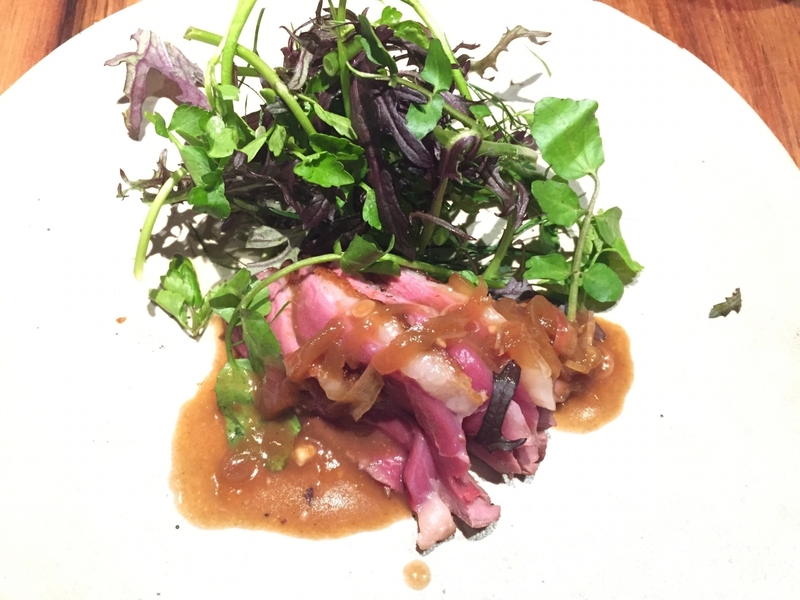 The dish, like its name, is Burmese, but its inclusion here showed the wide range and regional interests of Ăn Di’s chef, Shunji Morikawa. 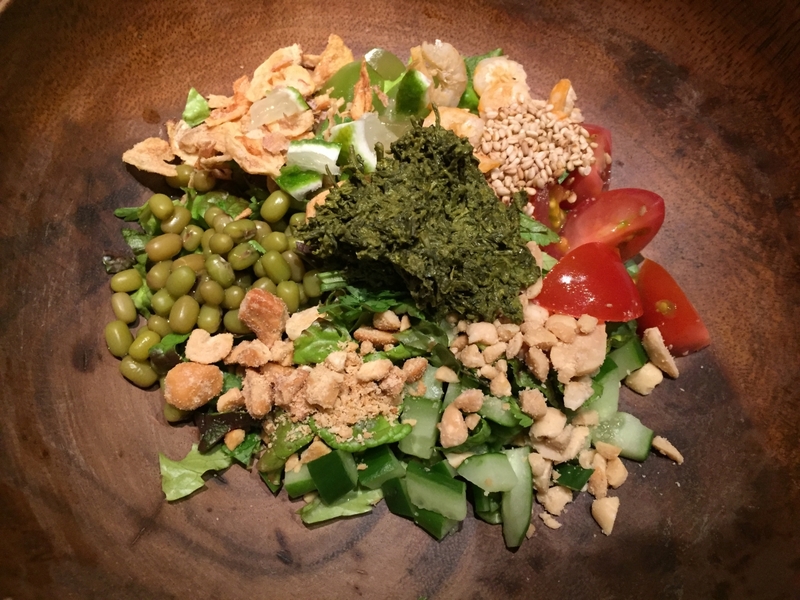 A popular dish in Myanmar, tea leaf salad uses fermented tea leaves, which taste slightly bitter and are believed to stimulate energy, and a wide assortment of vegetables, legumes, nuts and seeds. Chef Morikawa gives the Burmese dish a Japanese touch, using fermented Yaotome tea leaves from Fukuoka, which he mixes with dried shrimp, Shine Muscat grapes (a new variety of sweet and aromatic seedless grapes developed in Japan), toasted sesame seeds, tomatoes, edamame or fresh boiled soy beans, peanuts and fresh cilantro, topped with a basil dressing and plenty of lime juice. 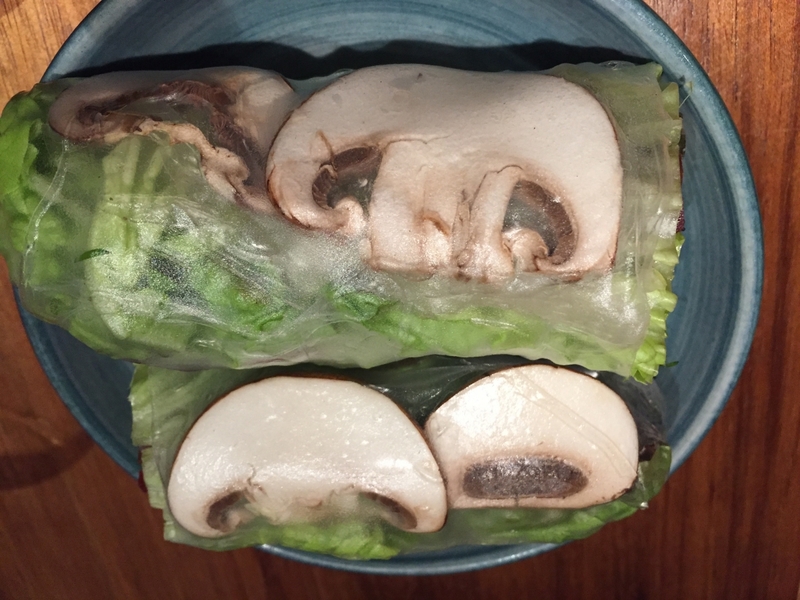 The next two dishes were creative takes on classic Vietnamese fresh spring rolls, or gỏi cuốn. The first was a delightfully tasty combination of sliced white mushroom, apple slices, mussels, lettuce and pickled peanuts garnished with a smoked coconut and sour cream sauce and a Japanese fish sauce known as shottsuru, all mixed with a pinch of black sugar and citrus juice. The servings are generous by Japanese standards. The combination of flavors was striking and extremely delicious. The shrimp spring roll that followed was equally creative, bringing together shrimp, shibazuke or vegetables pickled with shiso leaves, fresh cilantro, basil, pineapple and okra. The pineapple and shibazuke made for an interesting mix of sweet and savory. The vegetables and huge shrimp were extremely fresh-tasting. 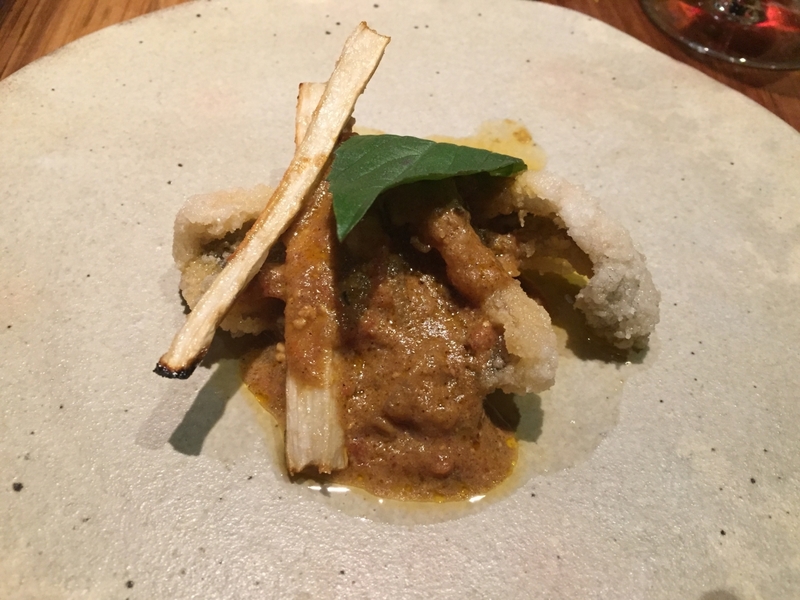 I found the eel and burdock fritters, which came next, slightly too salty for my taste, although it was, again, delightfully innovative. 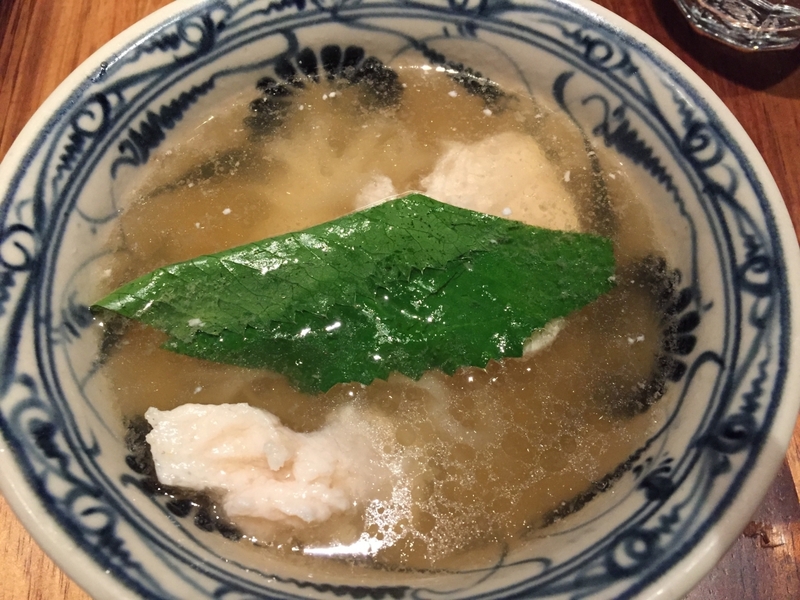 Much to my surprise, the eel and burdock were seasoned with cardamom, a spice very rarely encountered in Japan other than at Indian restaurants. The combination of Japanese and Indian ingredients worked surprisingly well. Our main course was duck with a lemongrass and soymilk sauce, producing an interesting mix of eastern and western flavors. The main course looked like something you would find in a French restaurant but tasted much more exotic. The very filling meal finally approached its delicious end with a fragrant bowl of chicken pho noodle soup. With its complex but subtle blend of spices and aromatic broth, this must be one of the best loved Vietnamese dishes. Chef Morikawa’s Japanese touch to this very Vietnamese dish came in the form of a dollop of sake kasu, or the lees left over from sake production, which is commonly used in Japanese cuisine for pickling and marinading. Even after a large meal, the chicken pho was surprisingly soothing. We left Ăn Di, happily satiated and full of wonder at the amazing gastronomic possibilities born from marrying the techniques and flavors of diverse culinary cultures.